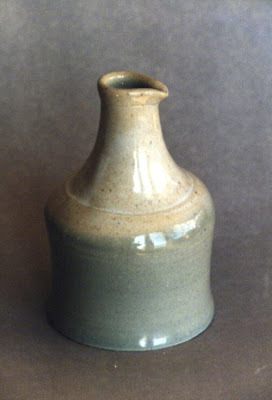 This small saki jug is an early experiment in bottle-type throwing. 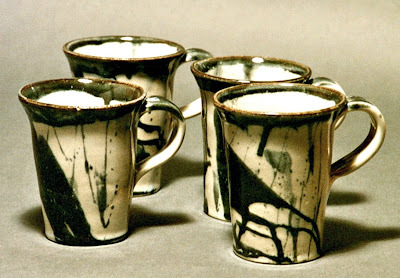 Stoneware works very well for these. 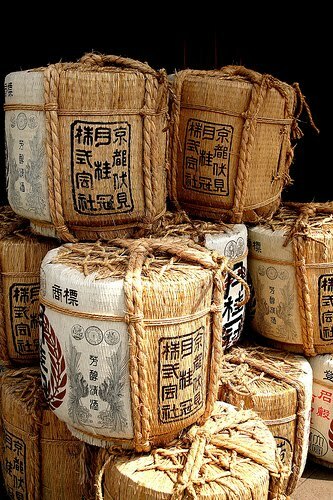 It's easy to heat the saki to just the right temperature using a microwave. I was surprised to find the Japanese were doing this the first time I went there. I have several saki sets collected here and there. 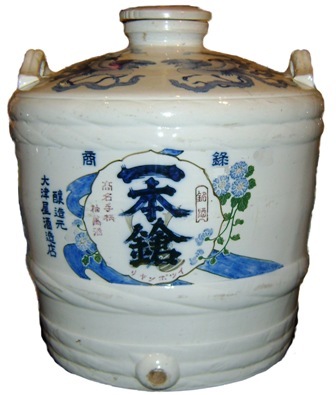 Wonderful ceramic saki barrels can be found at flea markets. I have two barrels similar to this one. One I bought in Japan, the other I found at a flea market in Tucson. And I have one straw-covered one that has never been removed from the straw wrapping. 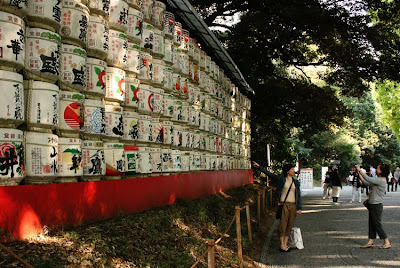 Many times huge barrels are lined up to make a wall of them at temple festivals. I love experimenting with spouts. 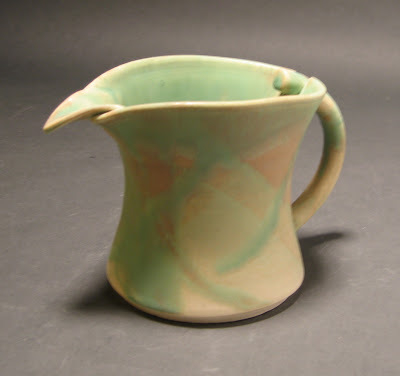 This little pitcher is designed to fit in the hand. Suitable for cream or milk or some sweet topping, the spout works like a champ. The next two pitchers are forms I've developed. It all started when I decided to alter the front to add a spout instead of forming one. 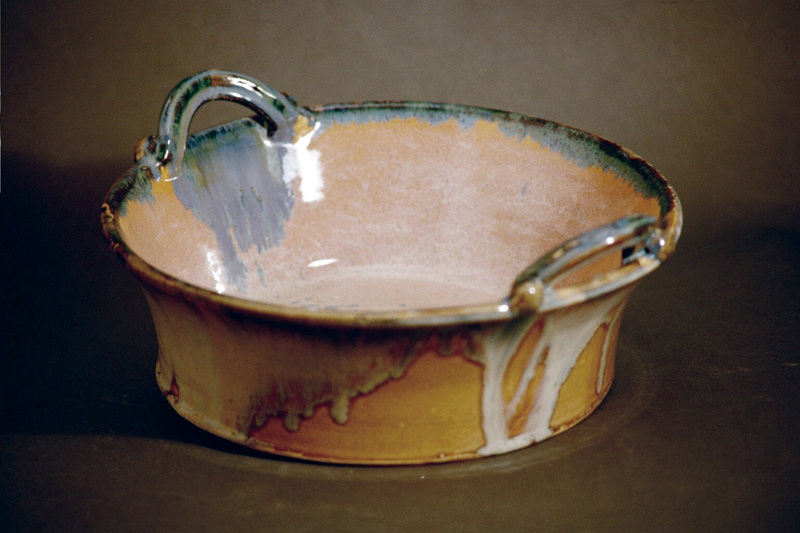 The handle echoes the split form at the back. It is attached solidly at the base and rests inside a split of the rim at the top. 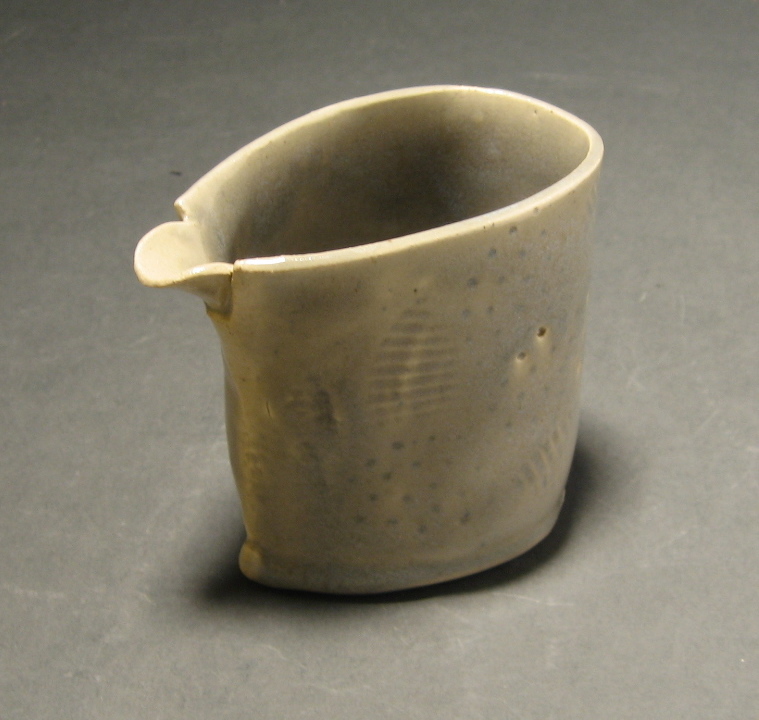 A clay button secures the base of the split opening. 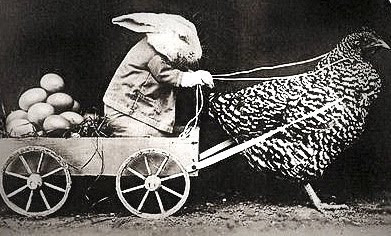 In another life, I was an antiques dealer. We used to have a booth at a few shows during the year and also had a space in a couple of antique malls. We specialized in furniture, although I liked to include all kinds of other things. At one show in particular, the territory was rich in nice pickings. We would load our booth up on Thursday, get up early on Fridays and Saturdays, make the rounds of garage sales and then reprice what we found to fill out our booth. One time, I scored a beautiful cut-glass pitcher and a darling pair of hand stitched linen child's drawers and bonnet, ca 1900. Many times at these shows, we would see this one dealer who also had furniture. He specialized in French pieces. He would go to Paris a couple times a year, fill up a sea van and sell at exclusive shows. I always enjoyed talking to him. He was a real Southern gentleman, hailing from Georgia and had the most beautiful, soft southern accent. He had a wonderful French Porter's chair similar to this one from the blog, My French Country Home (excellent blog, by the way). These chairs have a tall, hooded back because Porters, who were like doormen or night watchmen/reception or lobby attendants would sit in the entrances of clubs, residences and apartment buildings and attend the doors, help residents with packages, etc. Many of these huge old buildings had lofty, drafty entrances. So the Porter's Chair was invented to keep the cold drafts away. My friend had owned a beautiful, old upholstered chair that was quite tall. Just tall enough to make it a real pain to move, load, unload, store, whathaveyou. So he had this beautiful thing at a show and one woman seemed very interested. My friend was equally interested in selling it. They discussed the price and he gave her a good quote. She pondered. He was sure he had it sold. Then she said, "Let me go find my friend and ask her to look at it." His heart sank. We all know the minute a customer says that, it's the Kiss of Death. The friend/sister/husband/dog takes one look and says, "What on earth do you want with that thing?" They never say, "It's PERFECT! Buy Two!" Sure enough, the friend came over, gave it the stink-eye, and said, "Oh, Lucille, if God wants you to have a chair like that, you'll find one at a garage sale." Since I love to bake, I make and sell a lot of baking dishes. I also love this shape. Thick, to hold the heat. Rather shallow for quick baking and for crispy topping. Have a flared shape for easy handling. 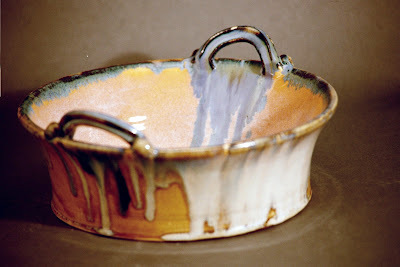 Smooth with a curved inner surface between the sides and the bottom for easy serving and cleaning. Equipped with handles for added ease in handling. Totally smooth with no cracks or crazing. 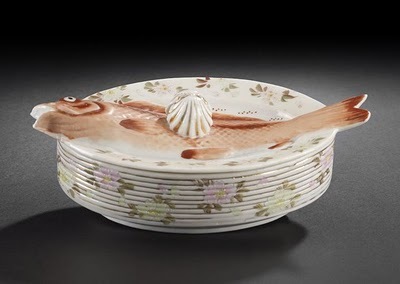 A rather odd dish....I wish I knew the dimensions. At first glance, you would never guess it is a covered tureen, as the all-too-skimpy notation says. 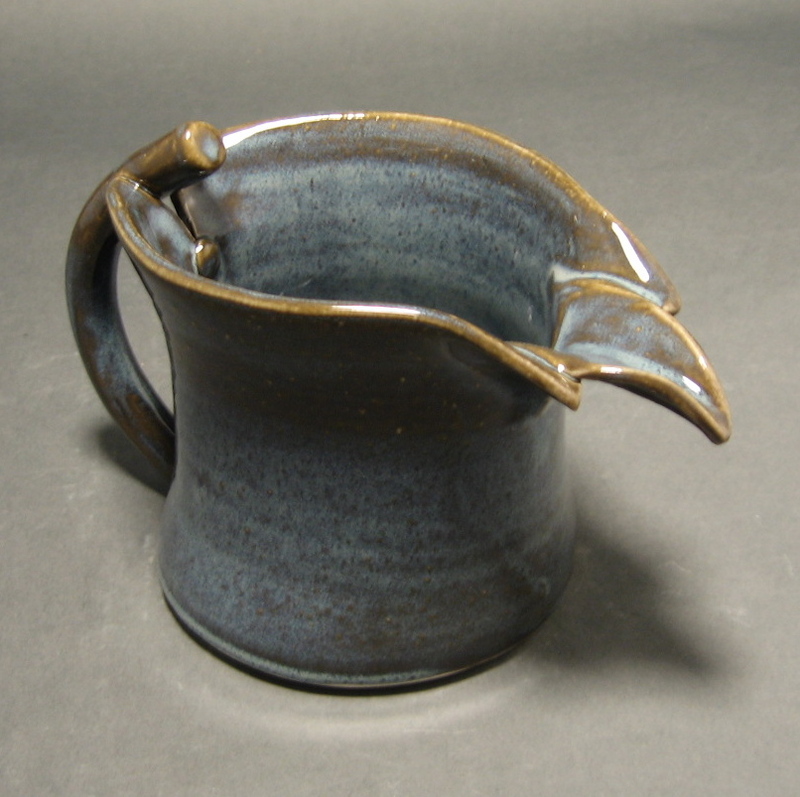 The shell form is the handle. Someone or several someones have taken good care of it, since the fish head and tail are still intact. And the tureen was being offered at auction. From what I can tell, the lid extends 3 plates down. There is a slight variation in the rim. The other odd thing is the flower decoration on the stacked 'plate edges' ; as if those edges would produce a pattern. And yet, somehow, we accept it at first. 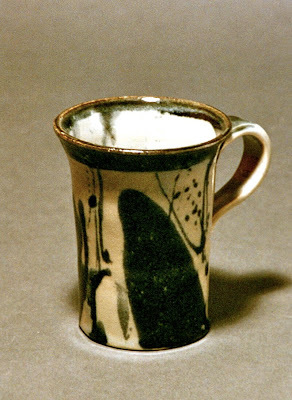 A set of 4 green and black mugs. 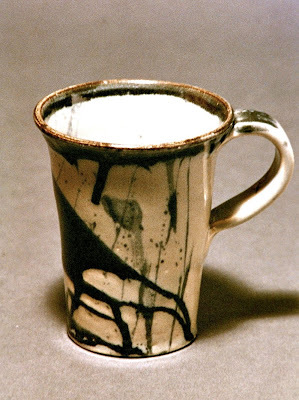 The rims were dipped in black, then I used a very large Japanese brush to slap and dribble glaze randomly on the outside surfaces. Do this over a floor covered in newspaper so you can be totally uninhibited. 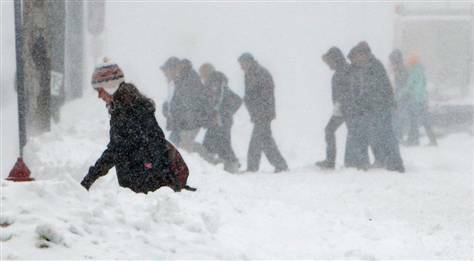 Well, it isn't quite THIS bad, but after a winter in Arizona, it feels like this. Everything needs to be done, it seems. We're still in the process of unpacking. 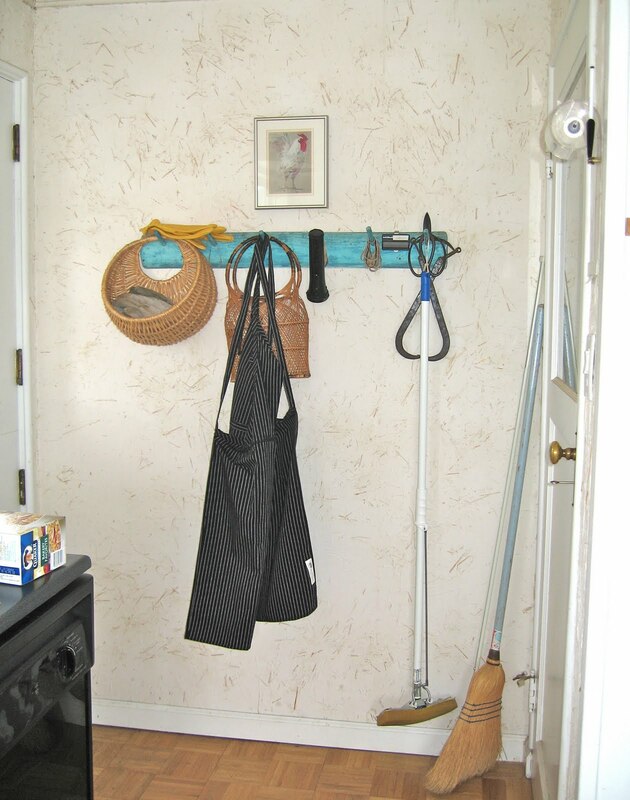 I need to deep clean every room, get blinds put up, rearrange the furniture, cull out 'stuff'. A lot of stuff. The grass is long, the ground is soaked. The garden must be planned and I really do need to dig up those irises that have bolted. But outside must wait; it's just too cold. At least I can think about what I'm going to make when I get back into the studio. Should This Kitchen be Remodeled? 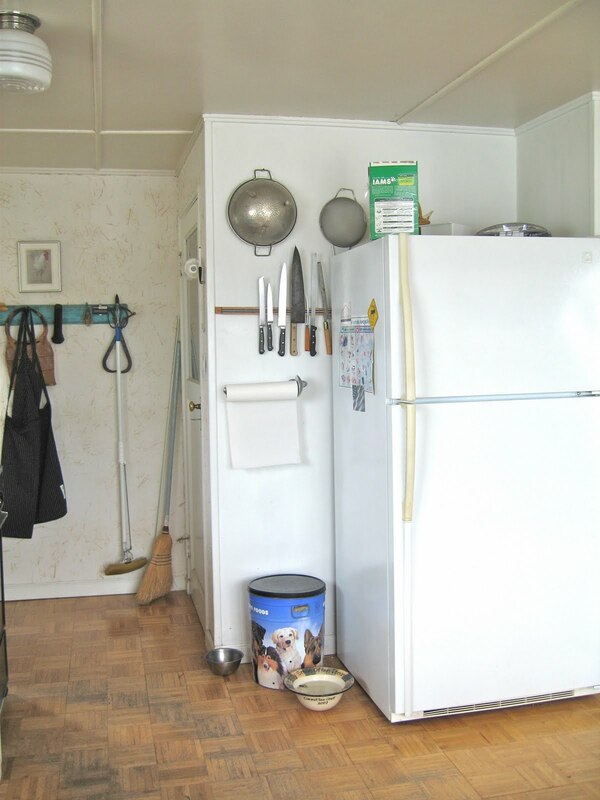 Here's a panorama of the present kitchen. Another coat of paint won't fix it. The drawers are all wooden and slide on the cabinet framing, not on smooth rollers. They are so worn they don't fit well anymore. They create sawdust in the drawer below. Several coats of white paint were also applied and I covered the swirly Kelly green linoleum(!) countertop and backsplash on both sides of the sink with off-white mosaic tile. I do love the dough and cutting board pull-outs, but I think this bank of cabinets have to be replaced with more workable ones. The sink would remain in the same place, the idea of two drawer units on either side are just too handy to change, but new drawers are badly needed. 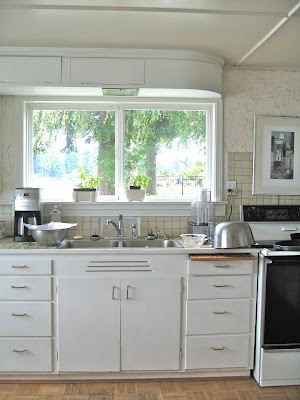 I would move the dishwasher (now a portable) to the double-drawer cabinet space at the left of the sink. 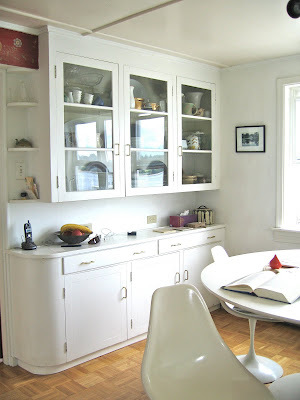 In this corner, I want to put a glass-paneled door in the place where the cabinet is. The door would open out to the right. Yes, it's a Knoll pedestal table and chairs. 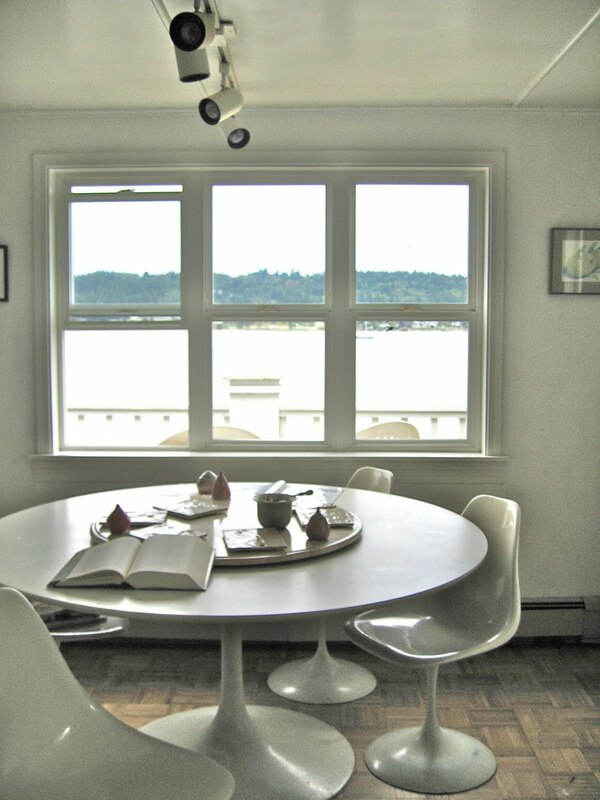 The table is five feet in diameter, so the center area is large in this kitchen. I would probably keep the three windows just as they are. The glass overhead cabinets are built in place. They are not really cabinets at all. 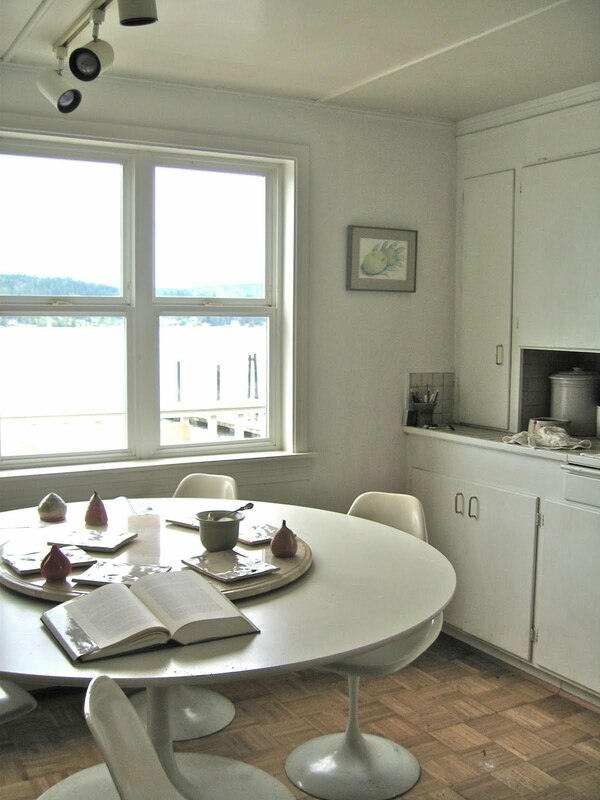 The original owner/builder, a Swedish shipwright, built them and probably the base cabinets as well. The original base cabinets that were on the other side of the room, (sink cabinet unit) are in our basement. I added new handles for all the cabinets when we moved in. 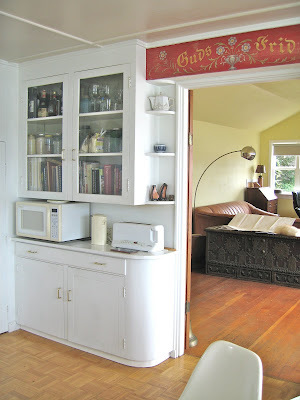 I like the curved ends on these old cabinets that flank the doorway. They match the high, overhead (and strange) cabinets over the sink. The glass cabinets hold a lot of dishes are just my height. I'm considering keeping the whole wall as it is even though both the cabinets below the glass ones above are shallow. The antique painting over the door says, "Guds Frid" meaning God's Peace or Peace be with you. It was painted by the original owner/builder of the house. The tiny pantry in the corner is so small and awkward. I would like to replace it with a floor-to-ceiling, shelved space or a corner cabinet space with an appliance garage. 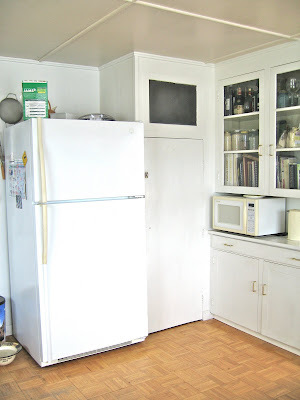 I want to switch the refrigerator with a new, wider stove with two ovens and put the refrigerator where the stove is now. The watercolor over the stove conceals an old ventelator fan which must be removed. 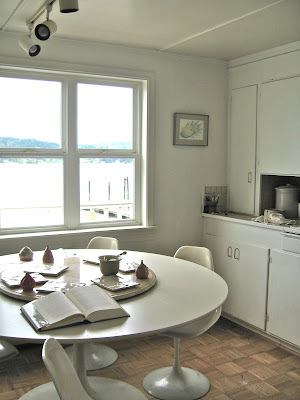 I want to install a wall of windows from the end of the cabinet on the right to the end of the cabinet on the left, where to the new door so that the entire sink area has no overhead cabinets, just window. The view is wonderful from here. There is a small porch off this door with antique glass windows on two sides. This is the current back door. Of course, the old ceiling and light fixtures need to be replaced. I'll find a new place for the round glass one. And I want to keep the floors, just have them refinished. I like the idea of engineered stone that looks like marble. It's durable and easy to keep clean. White cabinets, "marble' or steel countertops, stainless appliances, natural wood, a touch of my own tile here and there--a good clean look for the kitchen. Or renovate it down to the nub? P.S. 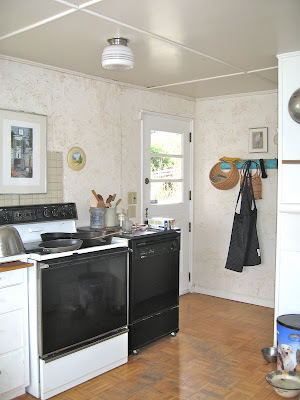 The walls behind the rack and stove were covered with cracked, wavy plaster and old stick-on copper tiles when we moved in. The sink cabinet top was covered with swirly deep green linoleum (!) 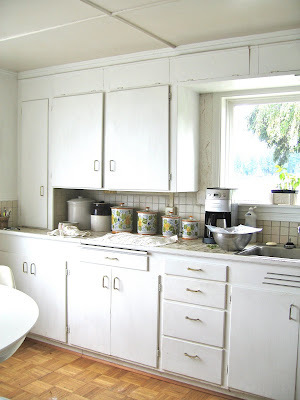 and the cabinets were painted cream, tan and pink on the outside; sky blue on the inside. The floor was grey linoleum so old and worn, there was no pattern anymore. I popped off the copper tiles (still have them somewhere) covered the walls with a mix of spackle and straw. 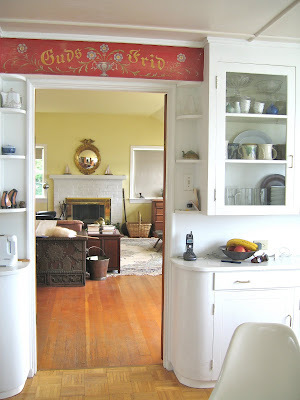 I love these walls; they look so Old French, but a new finish will have to be done, I think. But maybe I could repeat the wall in the new kitchen.